This corner unit is situated in the north-west corner of the conservatory. It is the only unit that is kept permanently shaded and with a controlled climate. 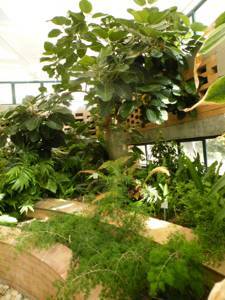 It is kept warm and humid, to create a forest atmosphere with plants from the warmer subtropical parts of South Africa, the emphasis on shady forests. It includes as a backbone the African mulberry tree (Morus mesozygia), the hippo fig (Ficus trichopoda), forest bell bush (Mackaya bella), large-leaved dragon tree (Dracaena aletriformis), forest justicia (Justicia campylostemon) and red lips (Metarungia pubinervia). Most commonly displayed throughout are various fern species of which the Tonga climbing fern (Stenochlaena tenuifolia) can be seen climbing against the back wall and old tree fern stumps placed in strategic spots. Other noteworthy ferns include the forest tree fern (Cyathea capensis) and Microsorium pappei, Blechnum attenuatum and the carrot fern (Asplenium rutifolium). 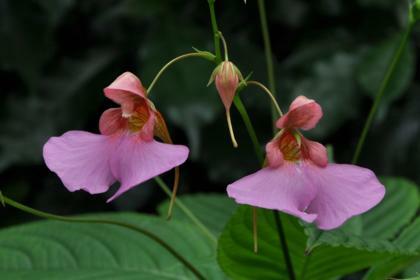 The bush lily (Clivia miniata) and Port St Johns impatiens (Impatiens flanaganii) are prominently displayed. Clivia miniata flowers during spring (orange, bell shaped) and Impatiens flanaganii flowers in late spring and summer (flowers pink). It is a shade-loving soft perennial with tuberous roots and goes dormant during the winter. As a general ground cover Plectranthus species can be found here as well as plants such as Peperomia blanda, Plectranthus oertendahlii and species of Begonia and Streptocarpus. our plant information website to find out more about the plants and how to grow them.